Shrek transfers well to the stage, retaining the charming humour of the film and managing to combine it with a sense of pantomime (don’t worry, the best bits – perfect for the summer). There’s still a month of previews to go, but there is huge potential here. The highlight of the night was without doubt Nigel Harman as Lord Farquaad. Hugely camp and hilariously funny, he made every line and opportunity for satire pay. Playing the tiny Lord entirely from his knees, he somehow even managed to do a lot with the dancing. Along with a great team of effeminate accompanying guards/dancers, even at this early stage I’d put my neck on the line and say that his performance was nigh on perfection. Wonderful stuff. The rest of the show is (understandably) more patchy at the moment. Richard Blackwood looks uncomfortable as Donkey, and doesn’t have the advantage that Harman does of his character not having stood out in the cartoon. Inevitably this performance is always going to be compared to Eddie Murphy’s, which means that he will have to make it his own in order to make an impact. Currently, he appears to be playing Eddie Murphy at about 70% capacity, which just leaves the viewer disappointed not to be seeing the original. Another difficulty that he has is a comparative lack of costume. Shrek is inevitably green, Farquaad has his tininess and the dragon (more on her later…) is a massively impressive puppet with come-to-bed eyes. Blackwood has no mask as donkey, which means that he can’t possibly achieve the iconic massive eyes and constantly nudging nose so much loved in the film. It’s difficult to know how he can get around this one, but I’m sure that there’s still more planned. It will be interesting to see what changes by the time press night comes around on June 14th. The other big stars are Nigel Lindsay, who does a great Shrek – cuddly and suitably grumpy. If you’re not easily offended, check him out in Four Lions, I saw it last week and was blown away (distasteful pun not originally intended…). Amanda Holden also made a charming Fiona. After a slow start, she seemed to get into her stride in the second half with a great opening performance of ‘Morning Person’, and excelled throughout at the cheeky toilet humour of Fiona. 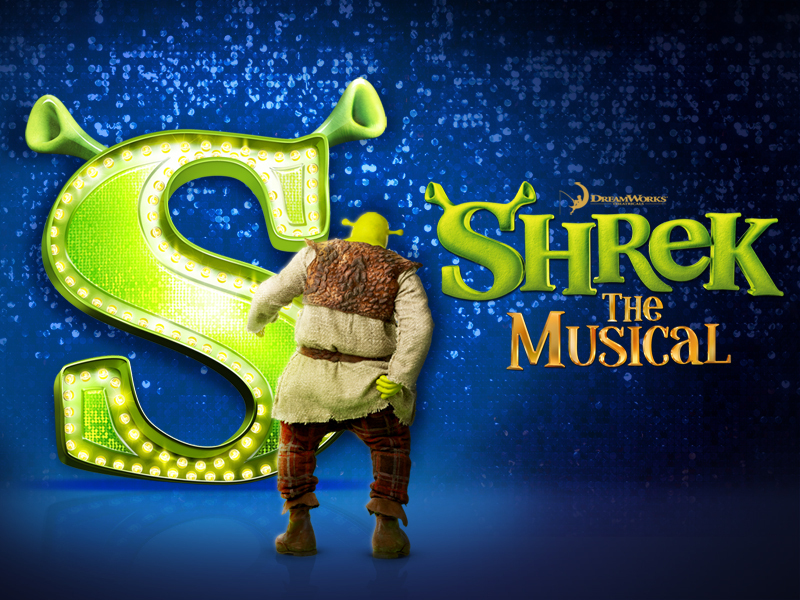 Shrek the Musical opens officially at the Theatre Royal Drury Lane on June 14th. I went in a group of 6 and booked £30 dress circle preview tickets via lastminute.com. We ended up in a box at the back of the stalls, with a view was straight on to the stage. I had recently heard good things about seat allocations from Lastminute, and will definitely be booking through them again after this.